FOXBOROUGH, MA—In a rare show of emotion, Patriots coach Bill Belichick began to cry during linebacker Tedy Bruschi's farewell press conference Monday, shedding a noxious black discharge that burned through the podium and a solid concrete floor before eventually coming to rest deep inside the mantle of the earth below. "He's helped create a tradition here that we're all proud of," Belichick said as the tears melted ribbons of flesh from his cheek, exposing his skull. 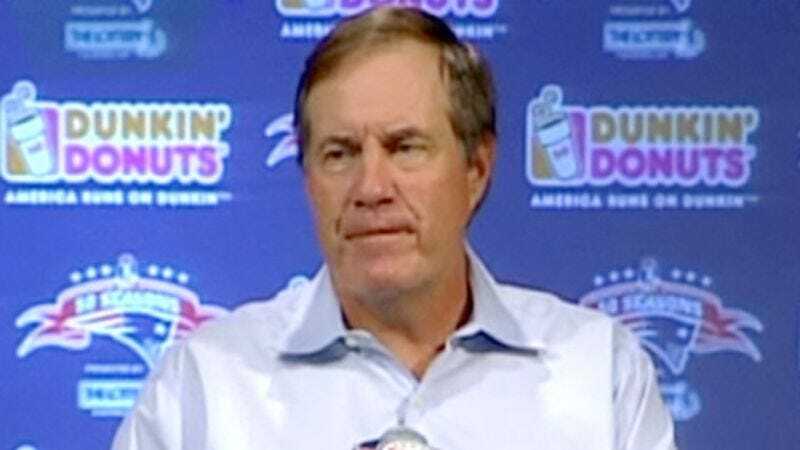 Reporters fled the scene when superheated chemical fumes emanating from the toxic liquid formed a cloud of poisonous gas, prompting Bruschi to vomit blood just moments after Belichick had called the two-time Pro Bowler a "perfect player." As Belichick sloughed grotesquely into a liquid heap, he was reportedly heard to ask if this is what love is.